Manchester City are in advanced talks with Swansea City over signing Wilfried Bony, BBC Wales Sport has learned. It is thought it would take more than £30m to prise the Ivory Coast striker, 26, from the Liberty Stadium. Swansea manager Garry Monk has said it will take an "astronomical" fee to secure Bony in the January transfer window. He was the Premier League's top scorer in the calendar year of 2014 with 20 goals. Bony joined Swansea for a club-record £12m from Vitesse Arnhem in 2013. He is on Africa Cup of Nations duty with the Ivory Coast for at least the next three weeks, and any deal would likely be concluded after his return. "Bony signed a one-year contract extension in November and, although that couldn't ward off interest from Manchester City, it did get rid of the £20m release clause in the striker's previous deal. Swansea can now demand £30m or more for the 26-year-old, not that a fee of that size will put off a club of City's financial power. As Bony is currently with Ivory Coast at the Africa Cup of Nations, he may well have already played his final game for the Swans." Arsenal, Liverpool and Tottenham were all reported to be interested, but the Premier League champions have made the first move to bolster their attacking options. They were without injured strikers Sergio Aguero and Edin Dzeko for the festive period and manager Manuel Pellegrini is keen to add further depth to his squad. The fee being discussed would break the Welsh club record sale of £15m that Liverpool paid Swansea for midfielder Joe Allen in August 2012. Just last week Pellegrini had indicated the Premier League champions were not looking to do serious business in the January transfer window. He told reporters: "We have important restrictions about amount of money and restrictions on players we can put in our Champions League squad." The club were hit with Uefa sanctions last year for breaching financial fair play rules which included a spending cap of £49m, plus any money raised from transfer fees. They spent around £48m in the summer on Eliaquim Mangala, midfielder Fernando, and goalkeeper Willy Caballero, although sold Jack Rodwell to Sunderland for a reported £10m and midfielder Javi Garcia joined Zenit St Petersburg for £13m. Should Swansea sell Wilfried Bony? 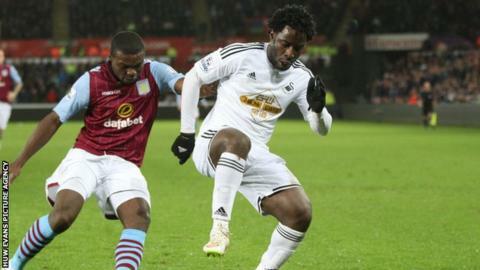 Read more on Should Swansea City cash-in on demand for Wilfried Bony?